Where do I find the Snowshoe Centre hours of operation? The Snowshoe Centre hours of operation can be found in the Snowshoe Centre Hours Page. What should I wear for Snowshoeing? Layers! Dressing in non-cotton (e.g wool, fleece, polypropylene) light-weight layers with a waterproof jacket and snow/rain pants is the most ideal way to snowshoe comfortably. Don't forget your gloves, toque, warm non-cotton socks, and sturdy, water resistant winter or hiking boots. Does Mt Seymour rent boots for Snowshoeing? We have Neos overboots for rent. They go overtop of your boots or shoes and up to your shin, and are a great idea if you do not own water repellent winter boots or hiking boots. Carrying the 10 essentials is always a good idea. We also recommend waterproof shoes and jacket. Where are the Snowshoe trails? The Discovery Snowshoe Trails (Goldie Lake, Flower Lake) are those run by the resort. The entrance is well marked and located at the bottom of the Goldie Magic Carpet. 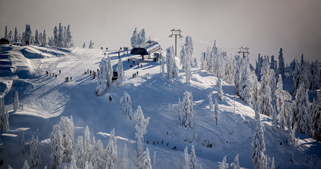 The BC Parks/Metro Vancouver Trails (Dog Mountain, Mt Seymour Peak, First Pump) begin from the kiosk near the bottom of the Mystery Express Chair. Please keep in mind that snowshoers are not permitted on the designated ski and snowboard runs nor are they permitted to use the lifts. Check our our new Interactive Trail Maps page for a map of the Discovery Snowshoe Trails. Do I need to leave a deposit to rent snowshoes? No deposit, however, we do need to see a government issued piece of photo ID. Can I reserve snowshoe rentals? No. Snowshoes are available on a first-come-first-served basis. Does Mt Seymour ever run out of snowshoe rentals? With approximately 400 pairs of snowshoes it is unlikely that we would run out of snowshoes, even on our busiest days! Does Mt Seymour have night snowshoeing or lit trails? No we do not. For the safety of our renters we keep closing time close to sunset time throughout the season. The last rentals are allowed out 1 hour before closing. None of the trails are lit, but if you have your own equipment and want to use the BC Parks and Metro Vancouver Trail networks (Dog Mountain, First Peak, First Lake) after dark you can, but should be well prepared and experienced in night backcountry travel. Does Mt Seymour rent snowshoes overnight? No we do not, as we cannot check to see if you are back safely, rentals are for the day only. Do you rent snowshoes for kids? Yes! We have snowshoes for all ages, starting from 3 years old. Kids under the age of six generally can't snowshoe very far, but they can try it out! Where should I park if I am snowshoeing? We ask that all guests who are snowshoeing to please park in the designated Parking Lot 5 which is located on the west side of the road that leads up to the main parking lot. Where can I take the snowshoe rentals? 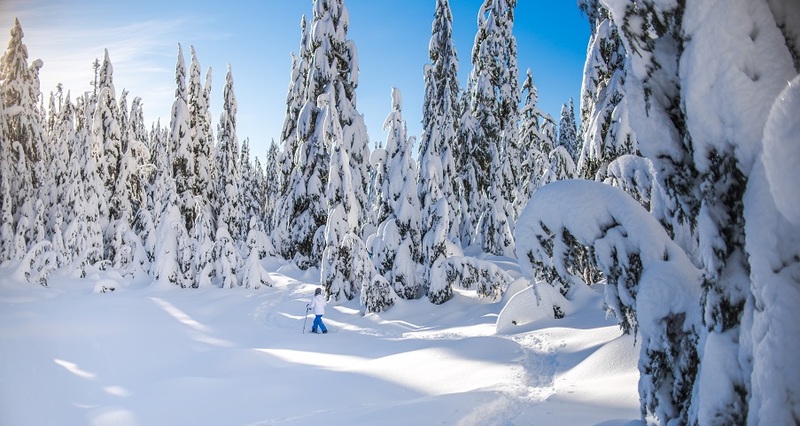 You can snowshoe in the Mt Seymour Discovery Snowshoe Trails (check our Interactive Trail Maps page) or you can even bring them on the BC Park and Metro Vancouver trails. Are dogs allowed on the snowshoe trails? Yes! Dogs are welcome on the all the trails, however you must keep them on a leash and we ask that you please clean up after them! Dog poop resurfaces in giant disgusting blobs in the spring! Please note: Dogs are NOT permitted on public tours such as the Discovery, Baby & Me, Chocolate Fondue, SnowFit, Legends & Lanterns, etc. If I am a downhill Season Pass Holder, do I receive any snowshoe benefits? Free access to the Discovery Snowshoe Trails all season. Remember: With all outdoor activities, it is important to plan where you are going and let someone know your intended route and the time you expect to return. Refer to the Adventure Smart website for more information on trip planning and preparation at www.adventuresmart.ca.